How to Play Spotify on Sonos without Spotify Premium? How to play Spotify on Sonos? Sonos has enabled voice control of Spotify via its Alexa-powered devices. The Alexa app now offers a choice of Amazon Music, Pandora or Spotify as the default service. That means you can simply select Spotify as the default and say,” Alexa, play Taylor Swift,” for example, and the speaker will play a playlist of Taylor’s most popular tracks on Spotify. Unfortunately, Spotify doesn’t support streaming from free accounts on a Sonos. As we all know, Spotify is the most popular music streaming service in the world and Sonos is one of the top brands of smart speakers. Here we will show you how to get them to work together with or without Spotify premium account. To use Spotify on your Sonos speaker you need to download and install the latest Sonos update. Step 1 Setting up a Spotify account on your Sonos. Open the Sonos Controller app on your smartphone, tap the “More” option, and then tap the “Add Music Services” entry. From the list of services, choose Spotify. On the Add Service page, tap the “Add to Sonos” button, and then tap the “Connect to Spotify” button on the next screen. The Spotify app opens on your phone and passes your login details to the Sonos app. Step 2 Controlling Spotify on your Sonos directly from the Spotify app. Open the Spotify app and select the song, artist, or playlist you want to hear. Tap “Devices Available” to see a list of all the devices currently connected to your Spotify account. Select your Sonos from the list and whatever you were listening to on Spotify starts to play on it. Since streaming music from Spotify to Sonos is not available for free account, you need to download Spotify music first, then add them to Sonos. 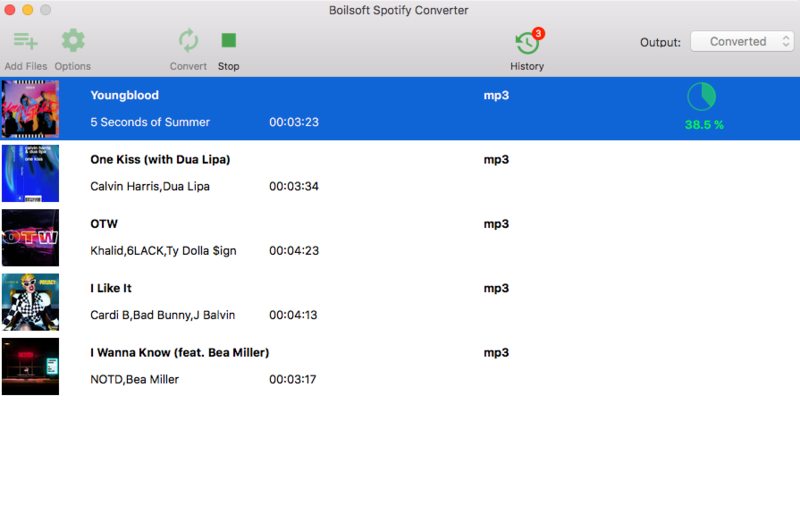 To download Spotify songs without Premium account, we recommend a professional Spotify downloader and converter — Boilsoft Spotify Music Converter. 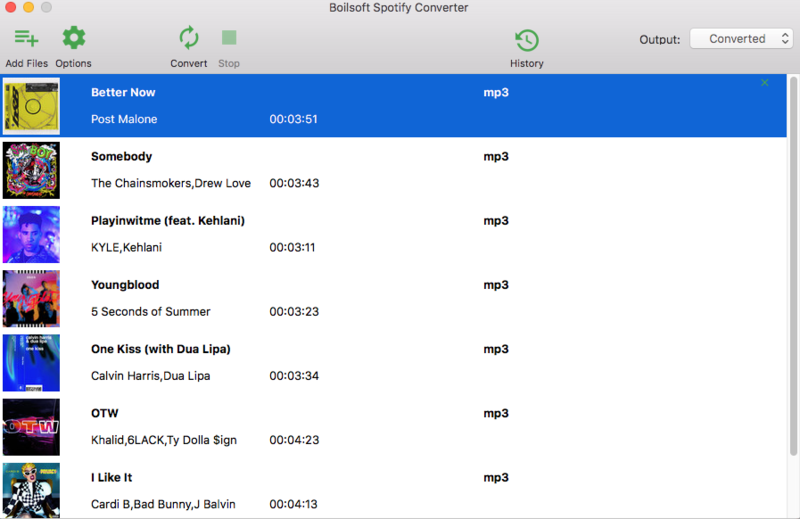 It allows you to download and convert Spotify songs/albums/playlists to MP3, M4A, WAV and FLAC with all original tags and 100% lossless quality. 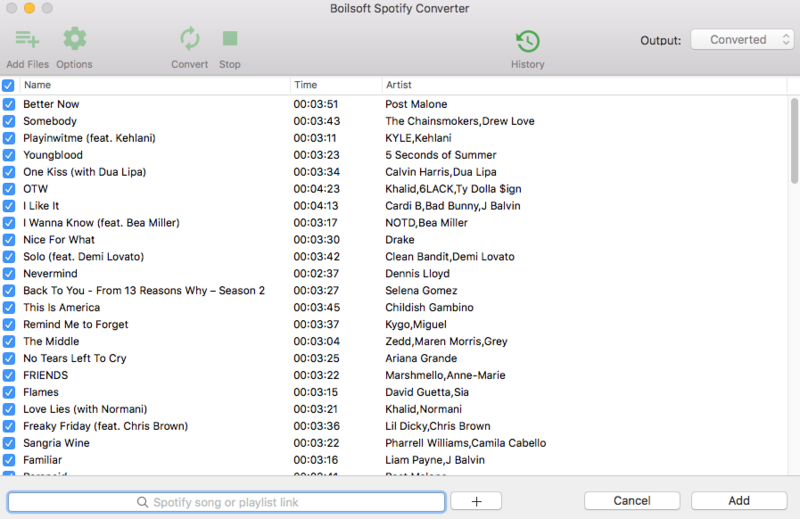 Step 1 Download and install Boilsoft Spotify Music Converter on your Mac or Windows. 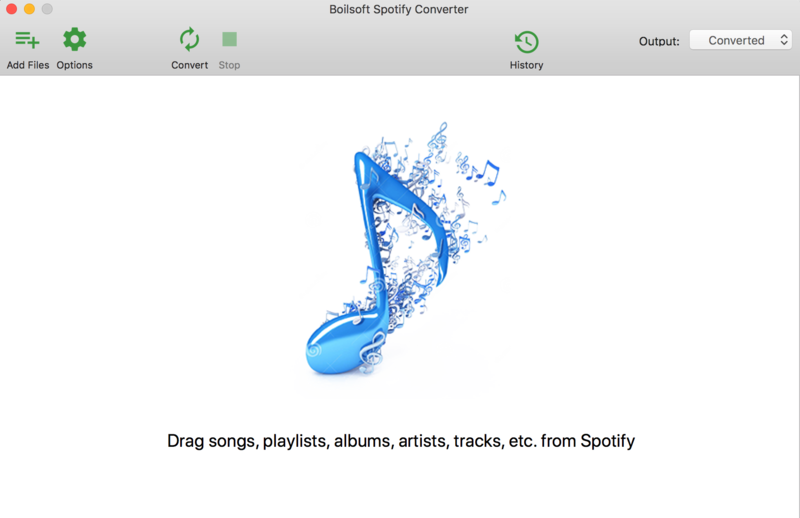 Step 2 Drag and drop Spotify songs, albums and playlists from Spotify app to the interface directly. Or copy&paste the link of the song, album or playlist. And then click the Add button. 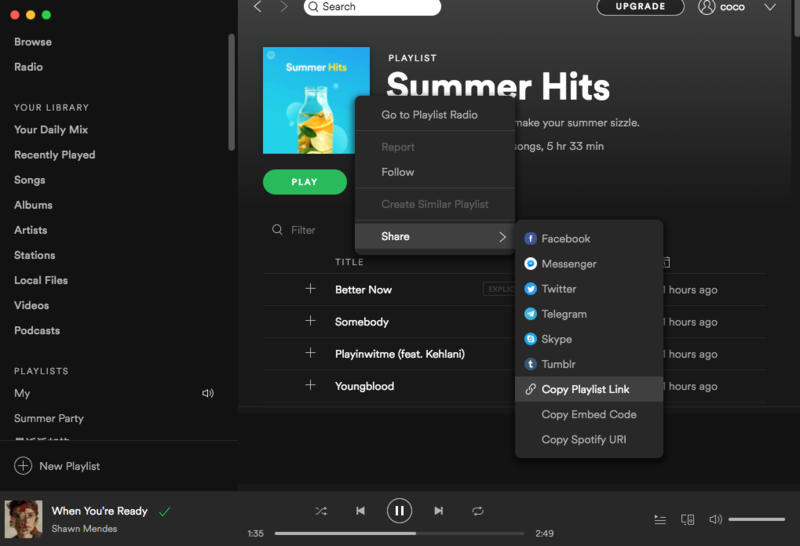 To copy a playlist link, right click the playlist corver or title and choose "Share" - "Copy Playlist Link". All songs in the playlist will be checked by default, you can uncheck the ones you don't want to download. Or add more playlists as you like. 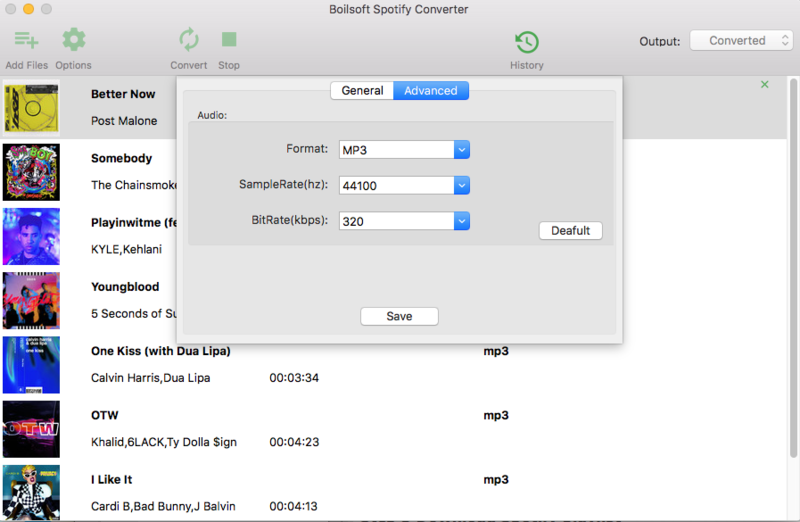 Step 3 Boilsoft Spotify Music Converter supports MP3, M4A, WAV, FLAC format. Click the Options button to change output format or output folder if you need. You can also change bitrate, samplerate according to your needs. 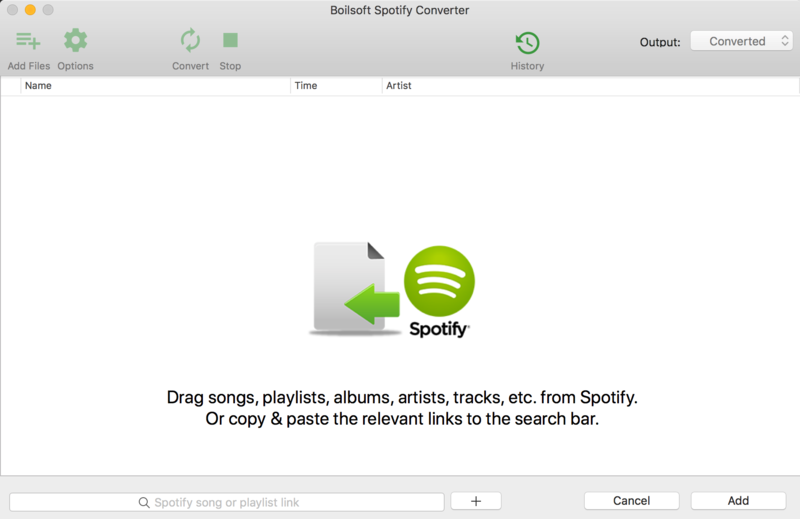 Step 4 Click the Convert button to start recording Spotify music to the format you choose. .
After conversion, you can find all converted songs by clicking the History button. Step 6 Open Sonos app on your computer. From the “Manage” menu, select “Music Library Settings”. Click + (plus) on a Mac, or “Add” if you are using a PC. Import the converted Spotify songs. Then you can listen to Spotify songs on Sonos. .